Stocks rose the most in six months Friday as technology shares, which led the longest rout in U.S. stocks in almost two years, bounced back to power major indexes higher. Treasuries fell, and the dollar rose with oil. The S&P 500 Index gained 1.4 per cent in the final hour of a wild up-and-down session, with trading 30 per cent above average, to post its best performance since April 10. The benchmark had all but erased a morning rally that reached 1.7 per cent, only to bounce higher after JPMorgan analysts said that selling forced by computer-driven strategies had likely run its course. Volatility ruled, though, with the index making another run at wiping out the gain before resuming its climb. 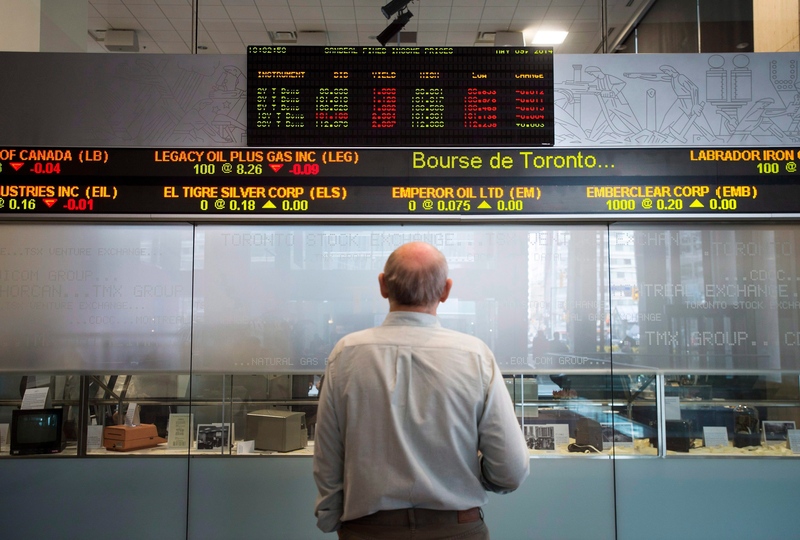 The S&P/TSX Composite Index rose 0.63 per cent - or 97.16 points - to close at 15,414.29 on Friday. Technology buoyed all the major averages, with the Nasdaq 100 Index rising 2.8 per cent just two days after its worst rout since 2011. Netflix Inc. rallied 6 per cent amid an “opportunistic upgrade” from analysts at Citigroup Inc. Activision Blizzard Inc. drove gains in gaming shares after releasing a new version of “Call of Duty.” The 10-year Treasury yield rose for the first time in three days, reaching 3.16 per cent, though down 10 basis points for recent highs. That weighed on banks even after mostly positive earnings reports from JPMorgan Chase & Co., Citigroup Inc. and Wells Fargo & Co. The group was down almost 5.5 per cent for the week. The rally, which came after two days of market tumult, was global, with the MSCI All-Country World Index adding more than 1 per cent. The MSCI Asia Pacific Index climbed from the lowest level since May 2017. European shares, however, slid into the close, with the Stoxx 600 Index turning negative to erase a gain that had reached almost 1 per cent and cap its worst week since February. Which of these TSX laggards over the last week is the best buy now? The S&P 500 rose 1.4 per cent to 2,767.13, while the Nasdaq 100 jumped 2.8 per cent. The Stoxx Europe 600 Index fell 0.3 per cent, retreating from an increase of 1 per cent. The MSCI All-Country World Index gained 1.1 per cent. The MSCI Emerging Market Index surged 2.6 per cent, the first advance in more than a week and the largest jump since March 2016. The Bloomberg Dollar Spot Index climbed 0.1 per cent. The euro declined 0.3 per cent to US$1.1558. The British pound fell 0.6 per cent to US$1.3155 The Japanese yen was little changed at 112.21 per dollar. The yield on 10-year Treasuries rose one basis point to 3.16 per cent. Germany’s 10-year yield slid two basis point to 0.497 per cent. Britain’s 10-year yield fell four basis points to 1.633 per cent. The Bloomberg Commodities Index rose 0.4 percent after two days of losses. West Texas Intermediate crude added 0.8 per cent to US$71.56 a barrel. Gold declined 0.5 per cent to US$1,218.05 an ounce.